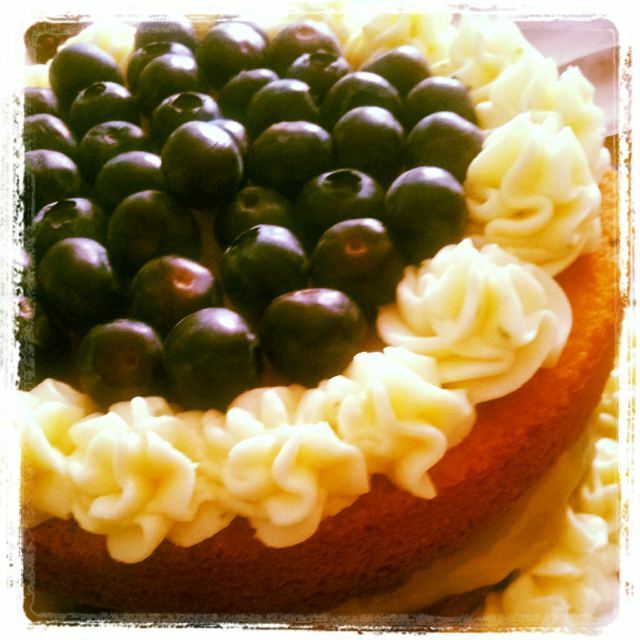 Instagram, I love you nearly as much as I love this cake! I woke up this morning to a very exciting email from a colleague this morning. Thankfully being that it's Easter Sunday, it's nothing to do with work. It was just a fellow insomniac sharing a random bit of news. That Instagram has finally arrived on Android. It made my day more than all the mini eggs that I got. And it was the perfect day for it as well because it's made the pictures of the lovely cake I baked today look even more special. Nearly two hundred days into this challenge, I still don't think my mum quite gets what I'm up to but she's resigned herself to the fact that if I'm coming to stay for the weekend, I'm going to have to take over the kitchen for part of the weekend. When she first dictated that we had to visit for Easter Sunday - because she had an egg hunt planned for Miss A - I said I would only come if I could make pudding. She grudgingly agreed. This then meant days of agonising how to transport a mousse cake (something I really want to try my hand at) from the far north of Wiltshire to the far south of Hampshire. Not a great distance unless you are transporting a cake that will a) melt in the slightest bit of heat or b) not survive being driven round corners at more than 5mph. During the recent heatwave I realised that I'd have to bake the cake here (I'm in Winchester as I type) for it to stand any chance of survival. 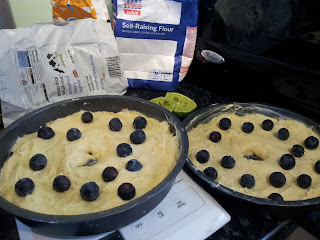 And whilst ruminating how much child free time I'd get (she doesn't sleep well when we're here) vs how much work the cake would take, I happened across a tweet from Jules (a different Jules to the Jules of Chocolate and Ginger Hot Cross Bun fame) about a gorgeous looking blueberry and lime cake. I mentioned my passion for citrus cakes the other day and the whole idea of lime just suckered me in. I've been wanting to make Lorraine Pascale's Mojitos Genoese for ages but it's one that needs to be made and eaten on the same day and I can't remember the last time (aside from Christmas) that I had house guests to cater for so it's another one that's still firmly parked on the 'to-do' list and is unlikely to be ticked off before this year's out. 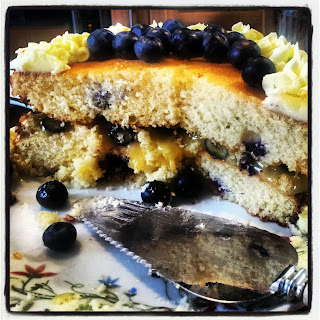 The bit that drew me to Jules' cake was the middle being sandwiched with lime curd. Of course it had to be home made curd because I doubt that you could buy lime curd from regular shops in deepest, darkest Wiltshire - especially when the local Waitrose doesn't even stock cocoa powder! People in Chippenham obviously don't make chocolate cake. So last Sunday, I devoted that day's recipe to trying Sophie Grigson's lime curd. And then I had to resist eating it all before the week was out. I find blueberries can be a bit hit or miss on the flavour but we scored big time with the ones my mum bought from Tesco. They were enormous and the flavour beautifully complemented the lime. I was lucky with my limes too - sometimes they can be pretty hard dry (as the ones I had for my curd were), but the two I had today were beautifully scented and brimming with juice. There's blueberries loose aboot this hoose! My cake was a little dry which was my fault because my cooker is generally a bit rubbish when it comes to cake and I've gotten into the habit of having to exceed the stated baking time. 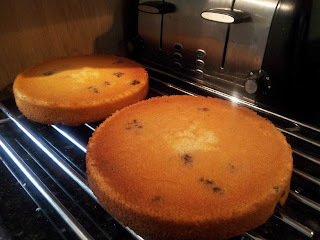 With my mum's cooker, I probably should've checked it at 25 mins as the cake was a little dry around the edge. This could've been rectified with a little lime drizzle but I had no spare limes. It tasted beautiful without and I actually enjoyed the crispy edges myself. It's high up on the bake again list once this year is over. Although I have a feeling that if I'm deluged with raspberries from my garden in the summer that I'll be making it again as a raspberry and lime cake. Thank you so much for sharing Jules! You can find the recipe here.